Most people come up with using a “smell hint” to train a blind dog. Some books, websites and trainers introduce a “smell hint” as a good way to help a blind dog. But I don’t recommend to use “smell hints”. Smell is difficult for us to manage because of its specific property, and adding a smell can cause a blind dog’s confusion. And there are other various ways to help a blind dog effectively with harnessing a blind dog’s remaining abilities and behavior characteristics. We can’t see smells! We can’t make sure even that we place a smell rightly and only on where we want. If a blind dog has learned to discriminate and follow the smell hint in order to look for the object or know the presence of it, more than one spots of the smell hint, transformed smell or disappearing the smell hint would confuse her. Also I have used a smell hint for my blind Dachshund Nono before. At that time I didn’t understand blind dogs well and hadn’t established a method of helping their success. I used a smell hint in training retrieve but now feel very regretful for it. I needed to teach formal style retrieve to her because it was included in the obedience exam required to earn a dog training instructor certification. Of course, there is no information about how to teach retrieve to a blind dog anywhere and trainers who were at dog school we took lessons didn’t know it. I created it all myself through trial and error with Nono. I had already used a dumbbell containing a small bell and Keep Going Signal to let her know that she is going the right way for the target, as hints for her to find the target (dumbbell). But finding the target thrown at a distance of over 5m before her is very hard for her to get to it. And stupid I came up with adding a smell hint but not thinking of what to do to make her want more to look for it. I added orange flavoring to her dumbbell. Each time I threw the dumbbell in the air and it bounced off the ground, the smell of orange flavoring must have spread, wafted, flowed to and accumulated in corners of the room. My choice resulted in confusing her and making it harder to find the target. I’m feel really sorry to burden Nono with my wrong choice. I highly recommend that you use the smell of the object/target itself if you’d like to use smell as a hint in training. If a object/target is important for your dog, she can detect its smell. We should enhance the value of the object/target for a blind dog but not add a new smell. Here is the video of the game for my blind Doxie Nono to enhance her ability to find what she wants by using her senses of hearing and smelling. You can see that she look for the target (Oball Rattle) depending on its sound and its smell. Nono is almost 12-yrs and her hearing starts to fade a little. Now it’s hard to hear the rattle sound of Oball Rattle but she can do this game by tracking itself smell and depending on Keep Going Signal I say. By classical conditioning, just like charging the clicker when we start clicker training with inexperienced dog, you should make the object/target a secondary reinforcer which your blind dog associates treats (primary reinforcer) with. Don’t rush to get perfect behavior but think to make your dog build on her success. The history of reinforcement leads to enhance the value of the target and behavior, and successful experiences lead to develop your dog’s self-confidence and self-control. 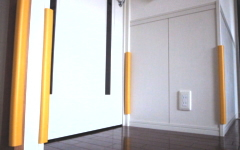 This way can helpful to enhance not only the value of the target but also a dog’s willingness of a difficult behavior. Set pattern can help blind dogs. Occurring in a predictable order makes them feel safe and focus on the target, your cues and thinking what to do. And if a blind dog learned to associate the behavior/target with particular reward, she would be thrilled to look for the target or behave while visualizing the reward clearly in her mind’s eye. I use this way in training retrieve. When we were practicing retrieve, I always gave mashed pumpkin Nono loves as a reward. She must have fetched a dumbbell while picturing PUMPKIN in mind. Memory has an important role as a means of supplementing impaired vision and blind dogs get/have an excellent memory. By set patterns (placement and procedure), blind dog can imagine and predict the environment and what will happen. Set pattern can help a blind dog feel safe, react and act calmly. If you’d like to teach new room layout to your blind dog, you should cover the sharp edges and corners of furniture, posts and walls with cushioning materials like a yoga mat, and install baby gates at the top and bottom of stairway in order to prevent her from injuring and falling, and then just give her enough time! Your blind dog will create new map of your room/house in her head through walking and checking around by using her body such as muzzle and paws and so on. Additionally, if you provide Aid Station for a blind dog, it would be more helpful for her. You can see some part of how a blind dog checks and understands the figure of a object and the height of a step in following video. Sound hints can tell a blind dog where she should go or the target is clearly and exactly. We can use touching on a blind dog’s body and the difference of textures as a hint or cue. There are many ways that we can use for training and helping a blind dog other than smell. 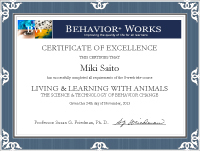 Nono’s retrieve described above, after that, was achieved at the exam and I earned a dog training instructor certification. I stopped adding a smell hint, and repeated the exercise countless times with sound hint of the bell in the dumbbell, Keep Going Signal, particular and special reward, and following the same procedure (set pattern). Here is its result! See here about the “set pattern” I used in this training. See here about how to teach this. A blind dog doesn’t think, understand, learn, identify, detect or judge a thing, object and situation by using only one of her abilities. It’s up to a blind dog what she choose and use as hints. Your blind dog may detect and learn by combining multiple her abilities, such as senses of hearing and smelling, senses of touching, hearing and smelling, and so on. The hints we provide are just our idea and just suggestion. Your blind dog decides what she uses as a hint and what she adopts as resources. I offer this nose work game (nose game) for Nono everyday. While I’m hiding the food-stuffed KONGs, she lays down and strains her ears to catch where I go and hide them. After I say “find it”, she always seeks first where she guesses from information of the sound I made, next where KONGs have hidden before, and finally other places. In order to achieve her purpose effectively, she uses at least her 3 abilities, her memory and senses of hearing and smelling, together. Further, the one thing I would really like everyone to focus on its the fact that I haven’t taught her how to behave, how to use each her abilities and what she should depend on as a hint in order to achieve purpose efficiently. All of them were came up with by herself and she figured out her own way! I just made her want to do it, have created and gave her the environment to keep her motivation high. You should try not to teach the behavior itself to your blind dog, but to make her love it and want very much to do so. If you can do it, your blind dog will use the most of her imagination and remaining abilities, figure out her own ways to achieve the purpose and solve the problem, and show you results beyond your imaginings. Thank you very much. My doxie is 16 and losing her hearing too. She has been blind for a few years. We moved to a new house and she has had some difficulty learning where things are. She wants to play but cannot find the toy. So we taught her to find the other dogs and she is their referee. Thank you for this post. I have learned a few new tricks to help her navigate her world.